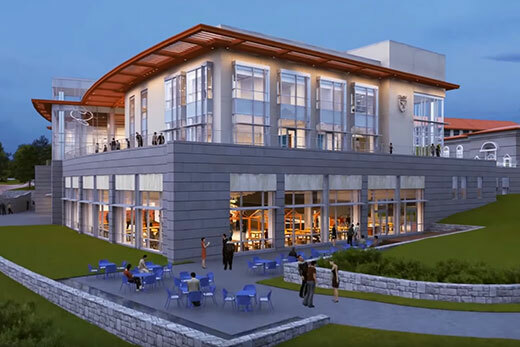 The new Emory Student Center will become a central community hub when it opens in summer 2019. As Emory creates its new master plan, an online survey seeks insights from faculty, staff and students to help guide future facilities and digital investments. Strategic framework: "One Emory: Engaged for Impact"
There is still time for faculty, staff and students to offer input in the creation of a master plan to guide Emory’s future facilities and digital investments. Community members are encouraged to participate in an online survey through the end of October to help identify planning priorities for all of Emory’s campuses and Emory Healthcare properties and facilities. Emory announced the master planning initiative last month with the launch of the survey, as well as a series of four campus town halls, held Sept. 26-28. “We appreciate the insight we have gained from those who attended the town halls and those who have already completed the survey, which seeks to understand your current living, learning and work environment and patterns at your respective campus,” Morey says. The survey features an interactive map where participants can mark areas where they work, eat, live, hang out, go out, study and enjoy recreation, noting if their experiences have been good or bad and offering further comments. Study respondents can also mark locations on the map that they consider areas of improvement, hard to reach, welcoming, unwelcoming, reflective, and difficult for pedestrians, with the option to provide comments on each. Those who complete the survey will be entered to win prizes including 10 iPads and 25 Visa gift cards worth $25 each. Community responses will be gathered and forwarded to Emory President Claire E. Sterk and the university’s leadership team to help make informed decisions about future investments that are best suited to supporting the new strategic framework, Morey says. Scheduled to be completed next year, the master plan is intended to support the goals and strategic initiatives within Emory’s recently announced strategic framework, “One Emory: Engaged for Impact,” which will help guide Emory in areas of academic, research and scholarly advancement. The master plan will also identify visions and opportunities for philanthropy, and create a pathway to a future fundraising campaign.